This work is part of a series of self-portraits which explore the idea of dislocation from setting, circumstance, and gender. The figures exist in uneasy relationship with their surroundings—a collection of public and private spaces that function more as images of memory projected on a green screen behind the figures than as three-dimensional environments in which the figures exist. 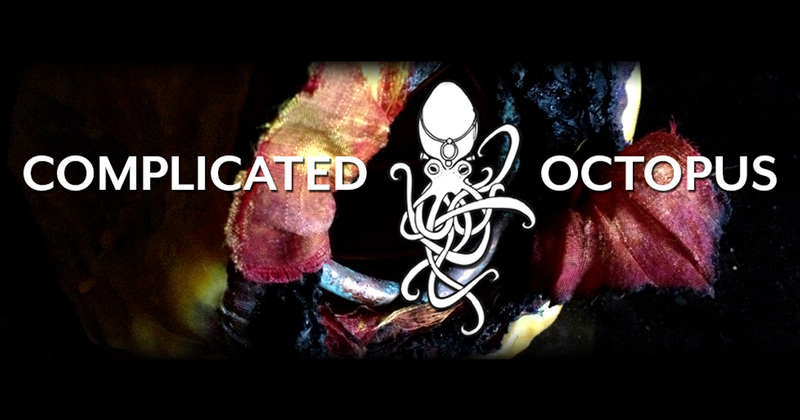 The series primarily consists of acrylic paintings on canvas. 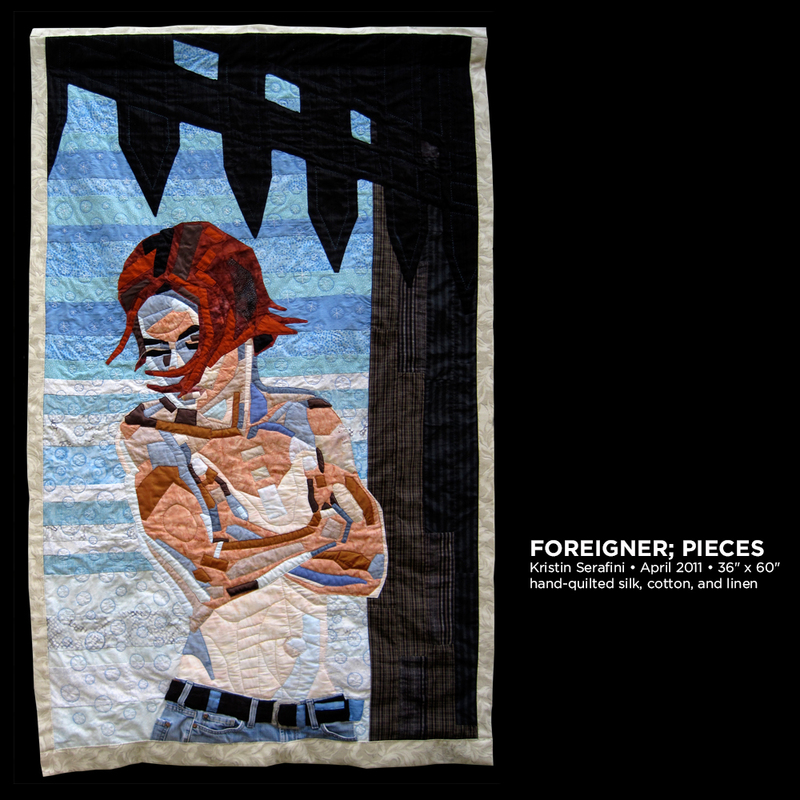 In Foreigner, Pieces I followed the questions of my own identity into another medium: textiles. 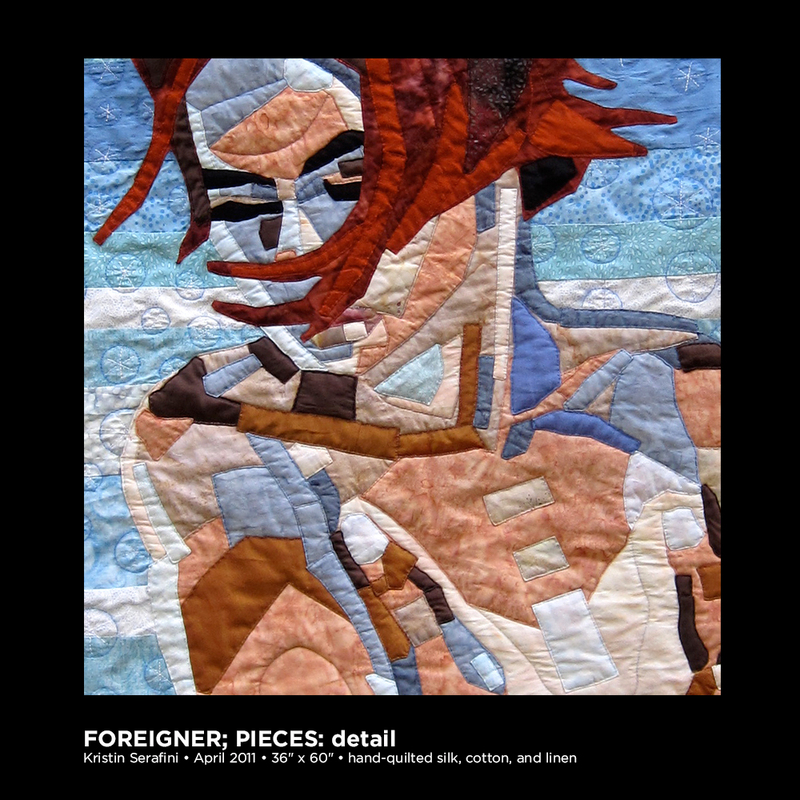 I reinterpreted one of the paintings from this series as a hand-stitched quilt, which is the same dimensions as the original canvas. In doing so, found myself exploring the identity of the artwork itself, and thus addressing the concept of gender from a different angle. While cutting, pinning, and stitching this image, I noted the contrast between the historically masculine (and privileged) activity of painting on canvas and the traditionally feminine (and pedestrian) activity of quilt-making. Questions of craft versus art emerged, as did observations about the postures required to produce the pieces. While painting, I worked in a mostly upright, standing position. While quilting, however, I spent a good bit of time kneeling on the floor, or sitting in a chair with the work in my lap. 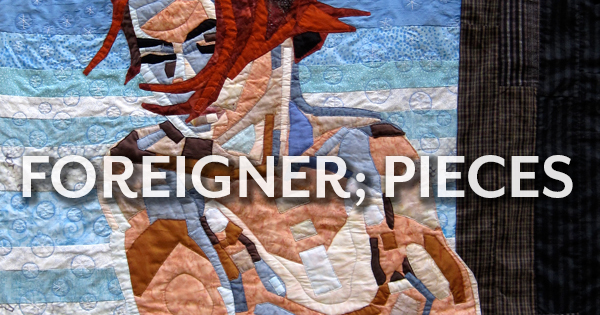 Having studied the work of artists such as Romaine Brooks, I want to continue the relatively new conversation around female self-portraiture—in this case by challenging the form of the quilt, a medium not often associated with figural self-portraits.